Description If you like TV quiz shows, you will love the Big Bad Quiz. 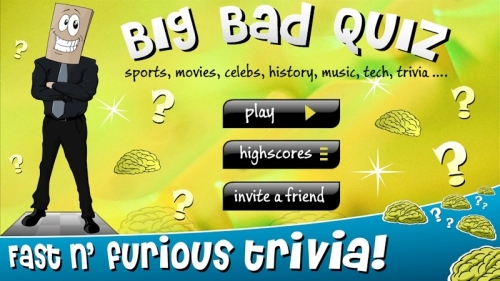 It is a fast, fun and furious trivia quiz game hosted by the one and only Bag Man. He is one crazy quiz master who has scoured the universe for the toughest trivia questions ever. With topics covering sports, music ,movies, history, celebs and more, the full game features over 150 levels of ultra fast non-stop rounds. With only seconds to answer each question, a brisk brain and snappy fingers are needed. No waiting for other players, just get going.